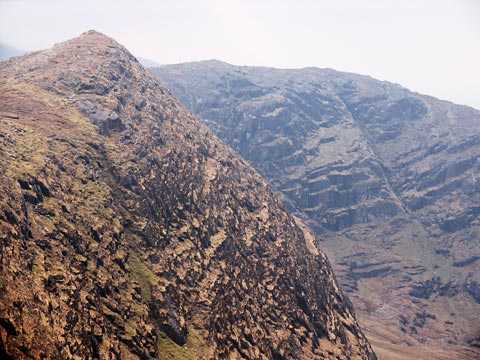 This peak is less conspicuous than its higher neighbour, Droppa, which has very steep cliffs on its N side, though it is Cummeenbaun which has slightly more prominence. 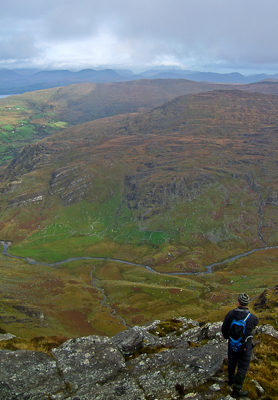 Cummeenbaun is the 531st highest place in Ireland. Picture from simon3 : Cummeenbaun from the east, Droppa in front. Picture: Cummeenbaun from the east, Droppa in front. 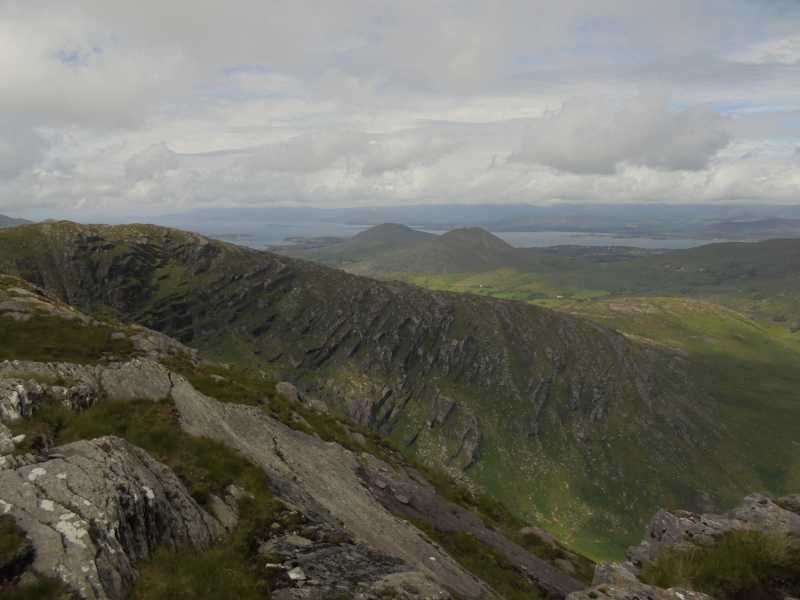 If you have ascended the indistinct lump called Caha and then go west towards Cummeenbaun you can savour 3k of one of the most remote and interesting ridges in the Cahas or anywhere in Ireland. 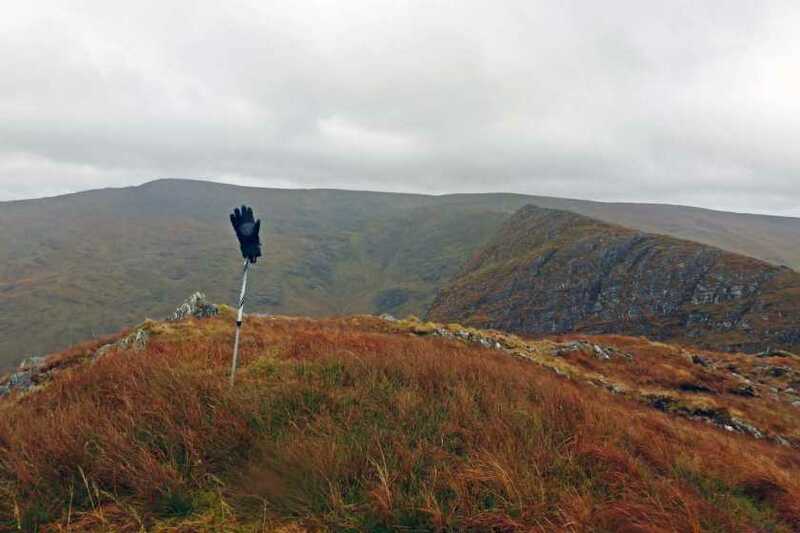 The southern side is much less steep than the northern however it is steeper than the equivalent side of the nearby Cusnaficulla-Knockowen ridge, which is somewhat similar. Around 800m east of Cummeenbaun you will come to the unsung, but spectacular Droppa. What an unusual name. Paul Tempan supplied the following information about it. this case it would appear to be more plausible." Picture from simon3 : Cummeenbaun simulation from the north. Picture: Cummeenbaun simulation from the north. Picture from CaptainVertigo : Just a plan: might never happen! Picture: Just a plan: might never happen! I have given some thought as to how to get to this much lauded spot (Cummeenbaun) while taking in the maximum number of Arderins and VLs along the way. Track 3036 is a 20k Onzy track which develops simon3's earlier Track 1963. 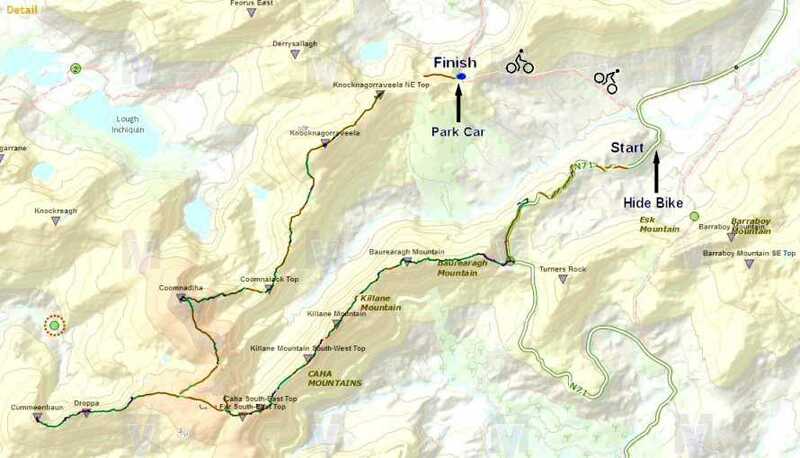 Onzy's Track could be extended without too much extra work to Killane Mountain, as an out and back. I have thrown together a plan that might work too, but before I do anything else I'm going to add the AAs and VLs and see what gives the biggest bang for buck. My suggested route: 4 Arderins of which one is a VL.. Can't see that my idea advances things very much!